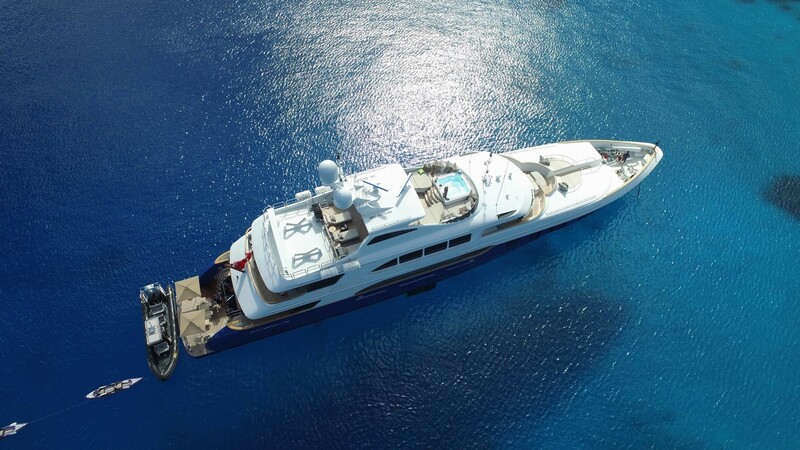 Superyacht LA DEA II is a luxurious 49m (160.9ft) Trinty motor yacht that was launched in 2007, she has received extensive refits in 2010, 2012, 2014, 2015 and 2018. 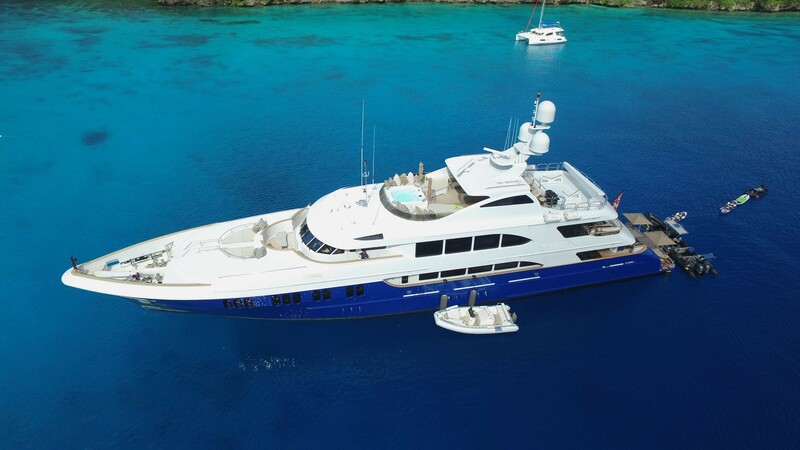 M/Y LA DEA II boasts a sleek powerful exterior designed by Trinity shipyard and an elegant sophisticated interior designed by Evan Marshall and Sylvie Charest. 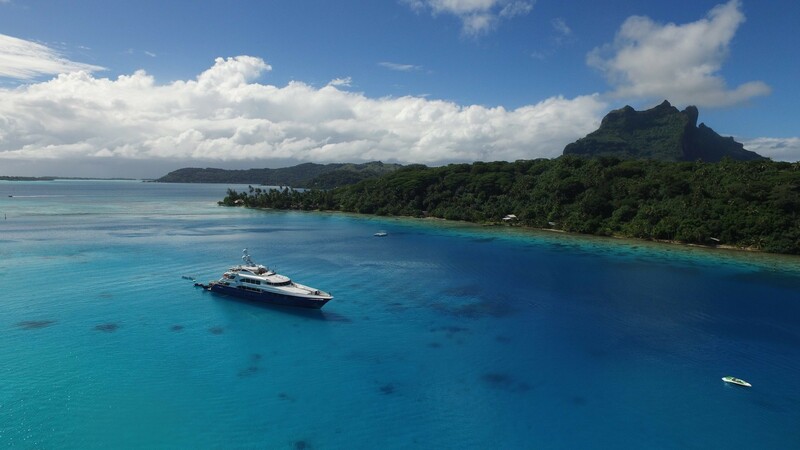 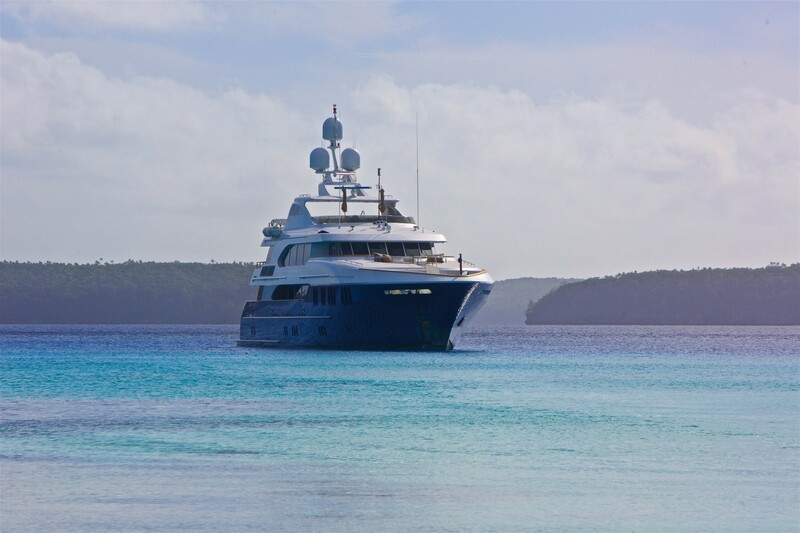 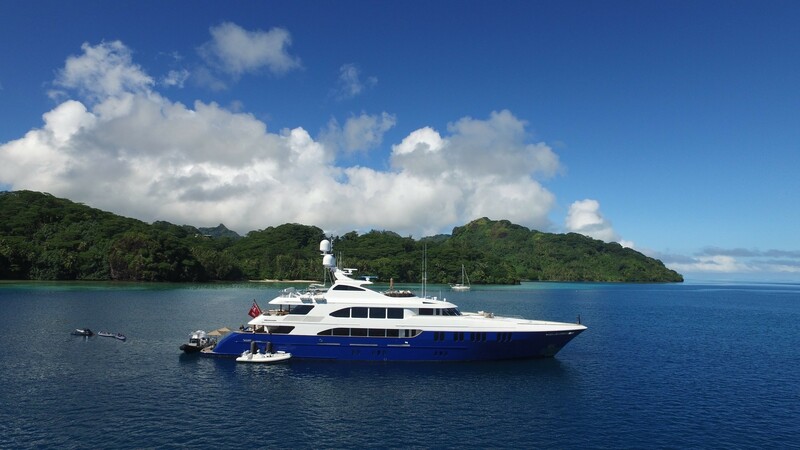 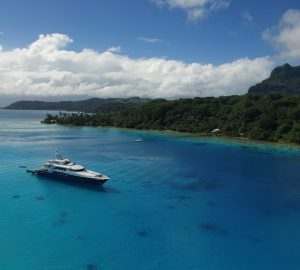 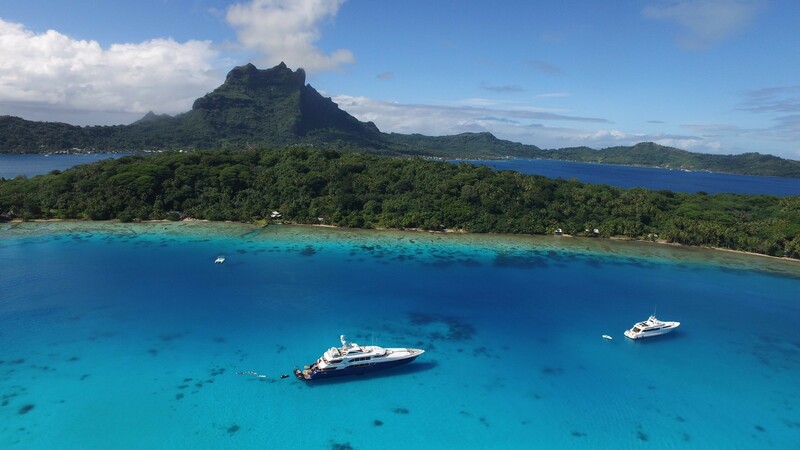 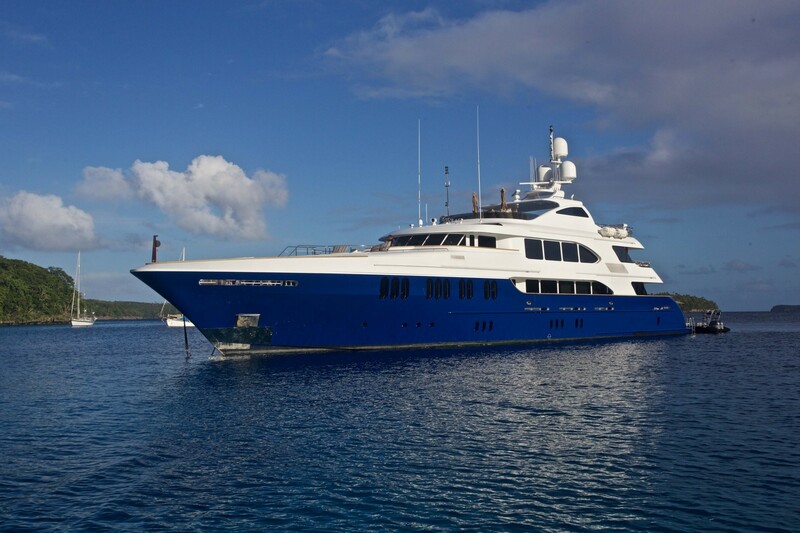 Crewed motor yacht LA DEA II offers accommodation for up to 12 charter guests in 5 deluxe cabins. 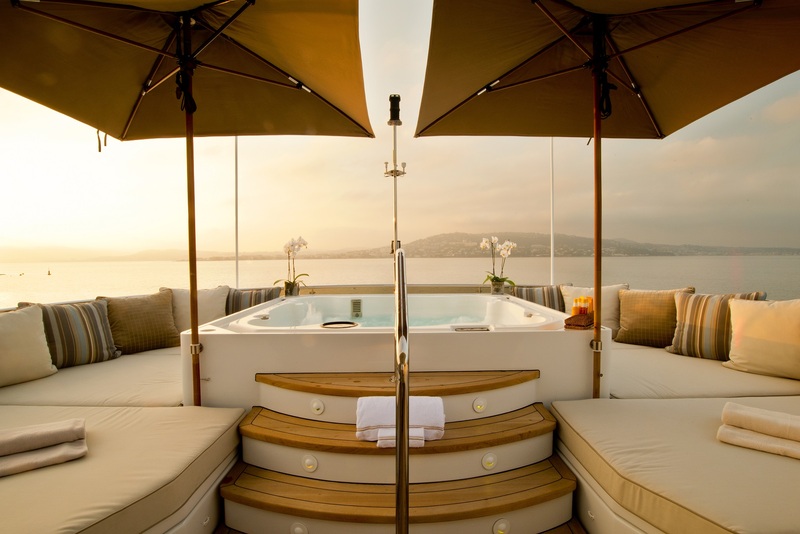 The Tri deck motor yacht LA DEA II (ex MAIDELLE) offers ample interior living, with emphasis on sumptuous amenities and voluminous spaces. 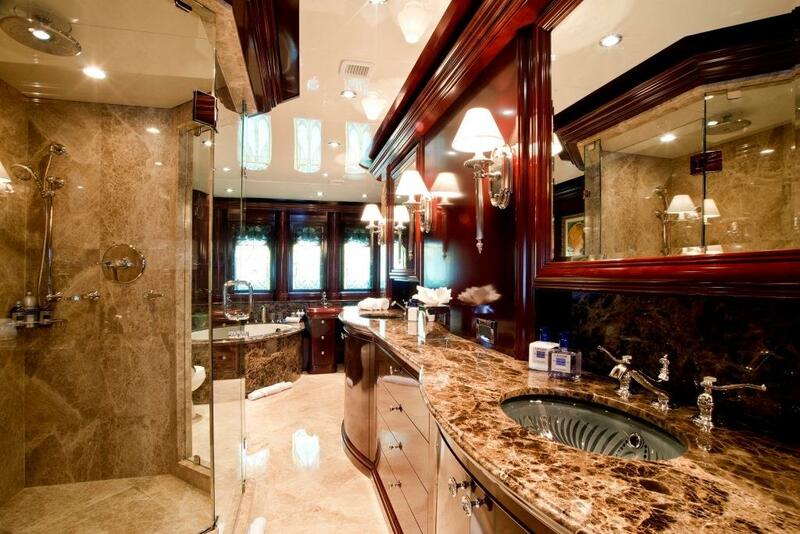 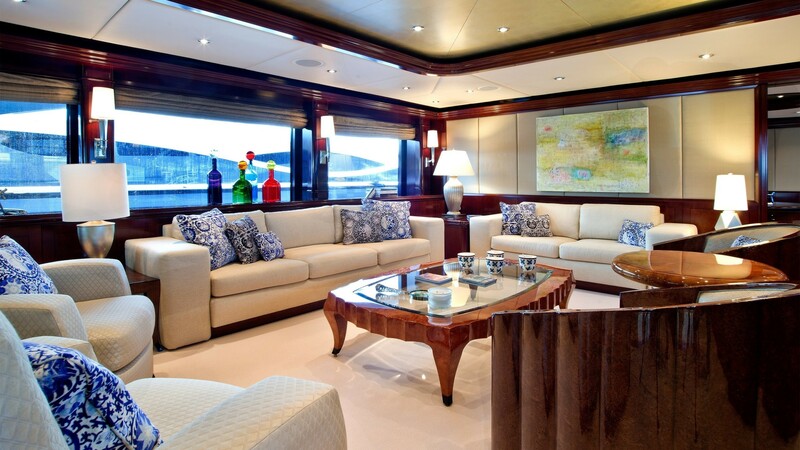 The décor is impressive and stylish, featuring high gloss mahogany and fine marbles, yet remains serene and classy. 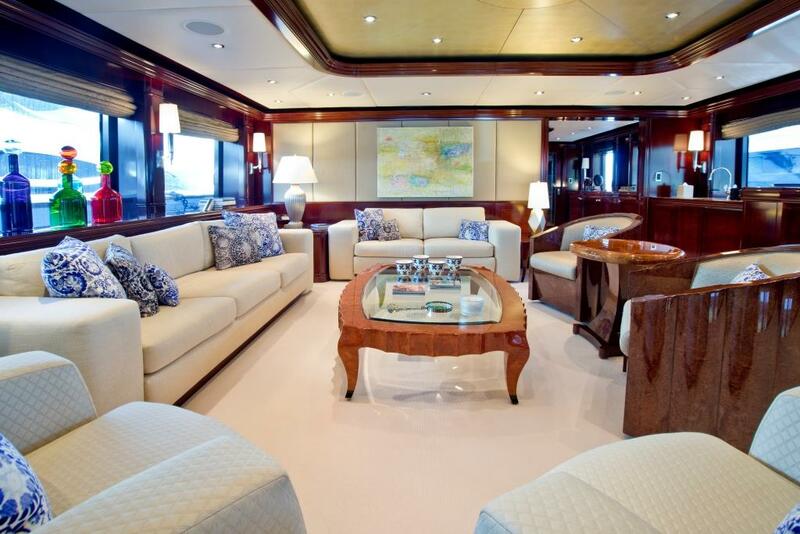 The salon is on the main deck offering plenty of plush seating on 2 sofas and 4 occasional chairs, a grand piano exudes elegance and is a fabulous focal point. 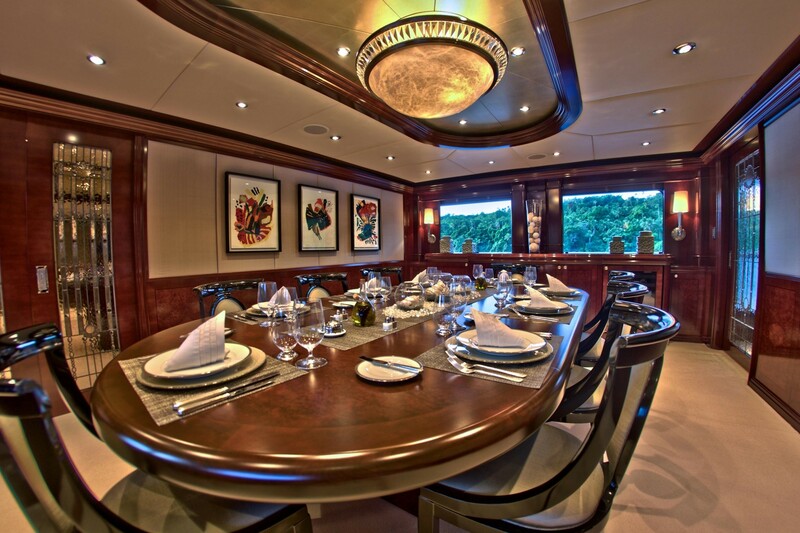 Separated by a bulkhead, the formal dining space is forward of the salon in an intimate setting. 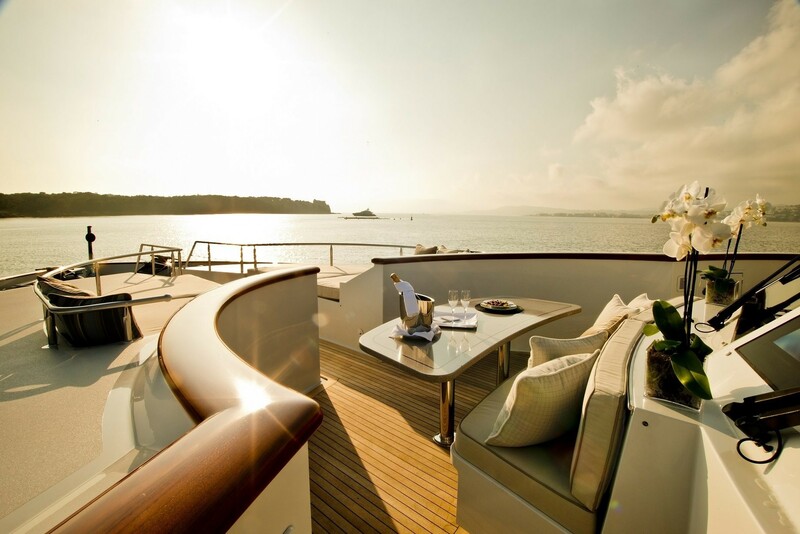 Thanks to the well-appointed windows throughout the yacht, she benefits from idyllic viewing while receiving ample natural light. 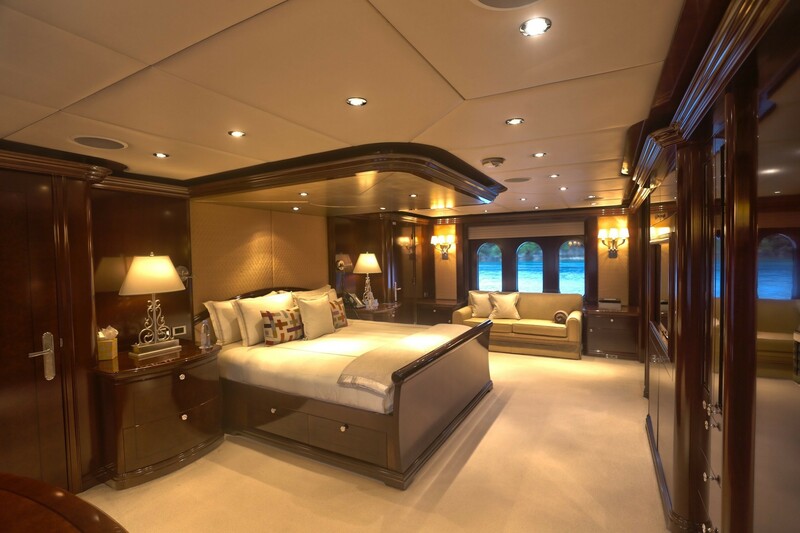 The master cabin is forward of the salon and dining on the main deck, boasting a private office, sofa, king size bed, his and hers walk-in wardrobes, full beam layout, massive en-suite and whirlpool tub. 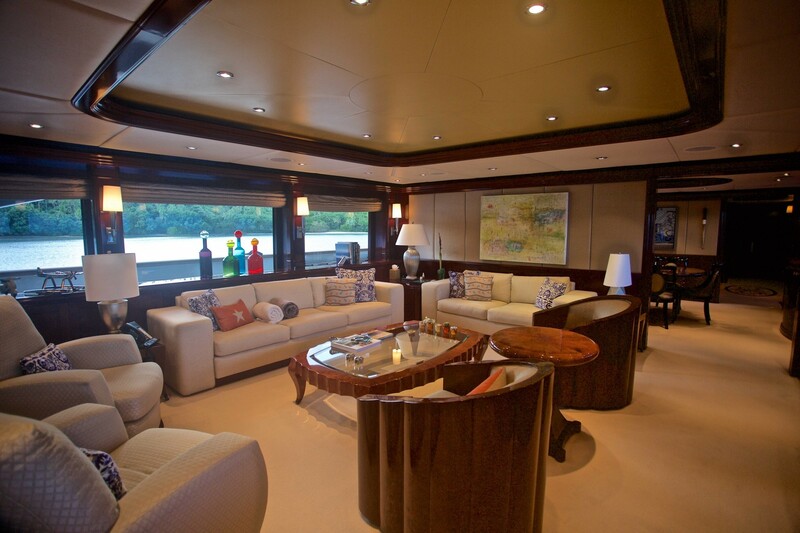 Above the main deck, the motor yacht has a further entertaining area in the sky lounge, with its L shaped sofa, chairs, coffee tables, games table and full wet bar. 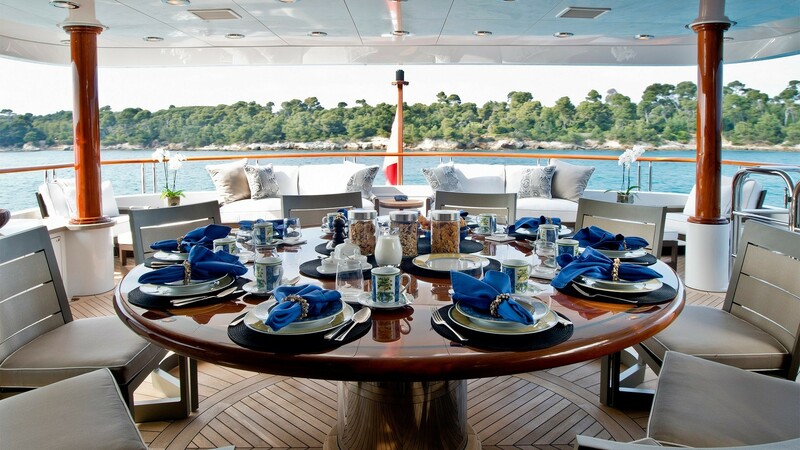 Exterior living is generous aboard the yacht LA DEA II. 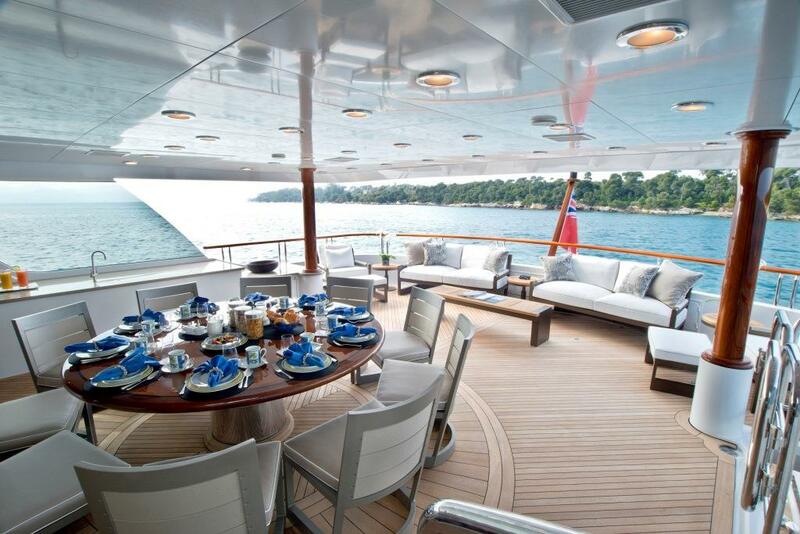 On the main deck, the aft deck space is huge offering an alfresco dining option and seating. 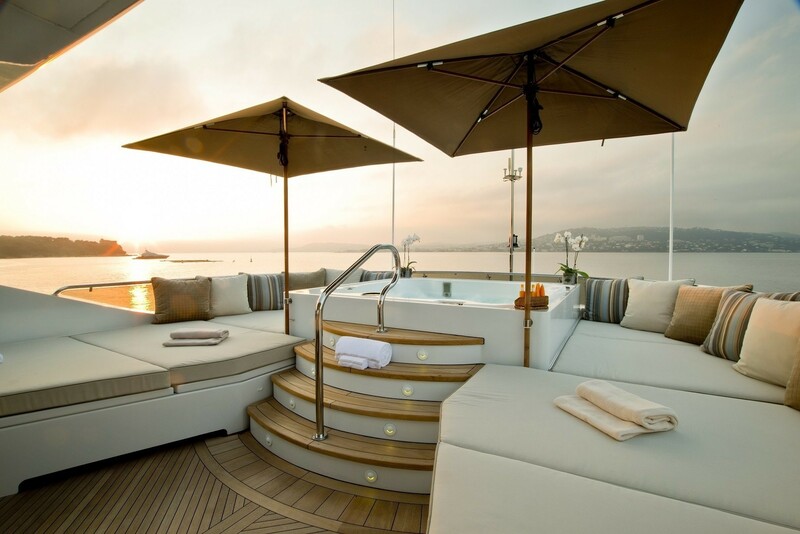 Further aft, the extended swim platform is perfect to make use of the may water toys on offer. 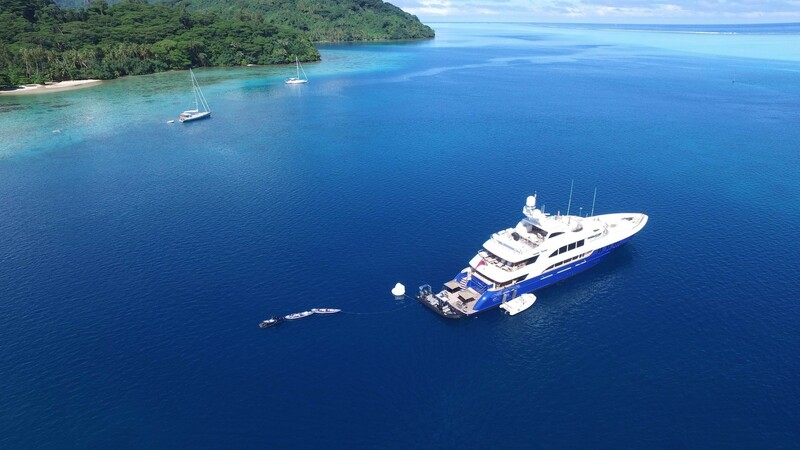 Due to the size of the swim platform, it doubles as the perfect teak beach and a romantic on the water dining experience. 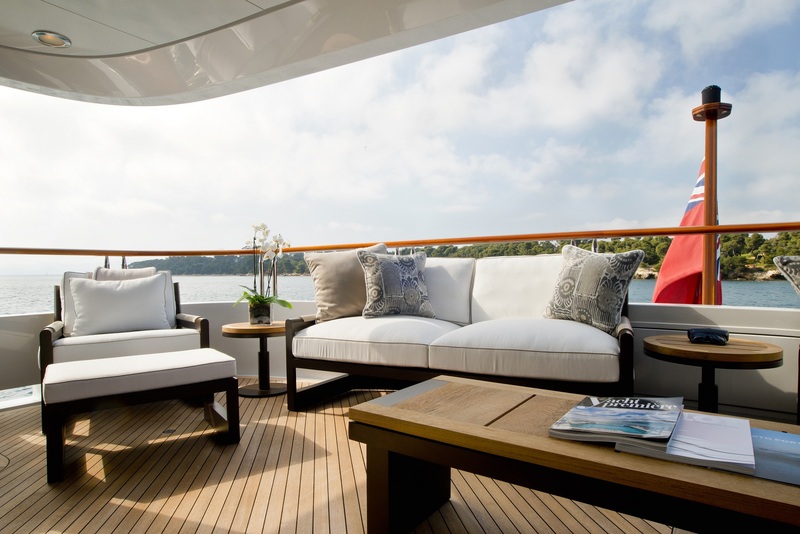 The upper deck has another alfresco dining option and is adjacent to the skylounge, ideal for entertaining both formally and informally. 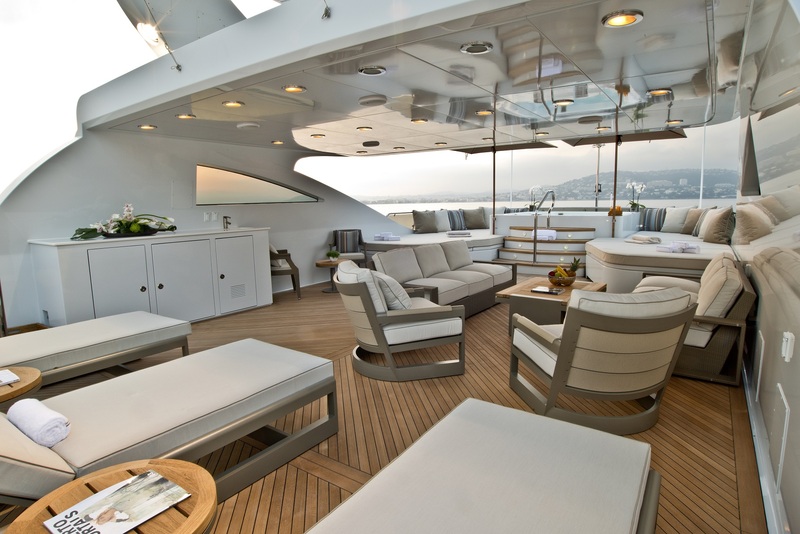 Forward of the skylounge, the foredeck boasts ample seating with small tables and 2 large sunpads. 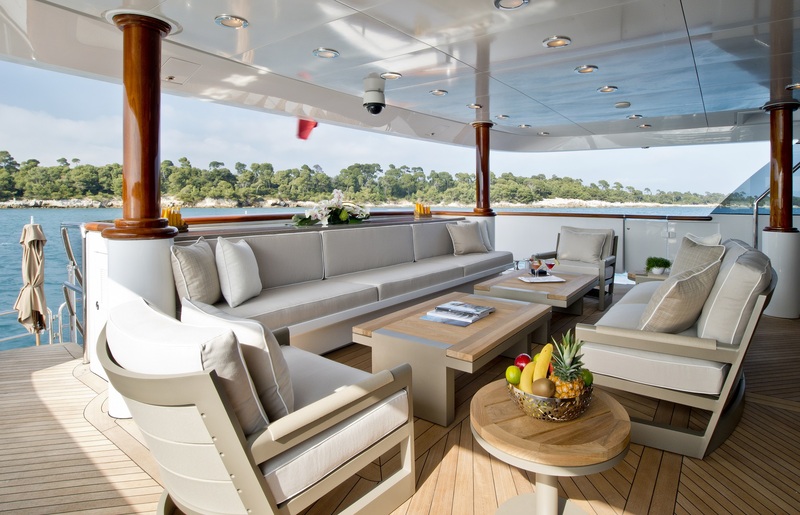 As a tri-deck design, the superyacht enjoys an upper sun deck complete with alfresco dining option, wet bar, chaise lounges, Spa Pool tub, sunapds and day head. 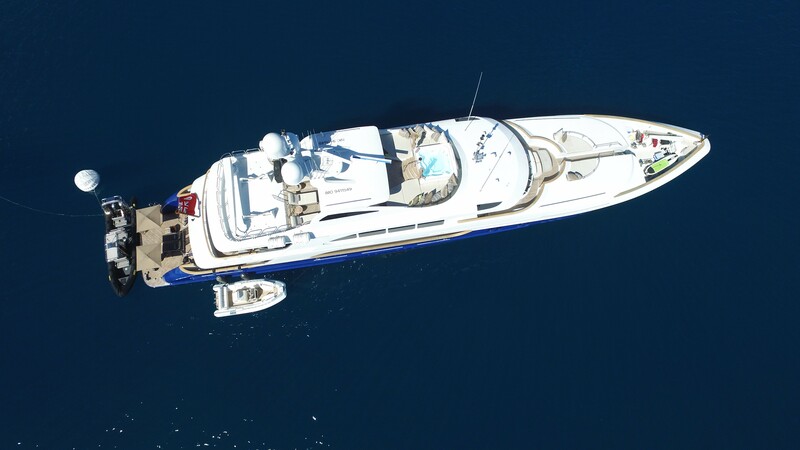 Trinty yacht LA DEA II has a beam of 8.5m (27.10ft), she is powered by CAT 3384hp engines with optimum speeds of 18 – 24 knots. 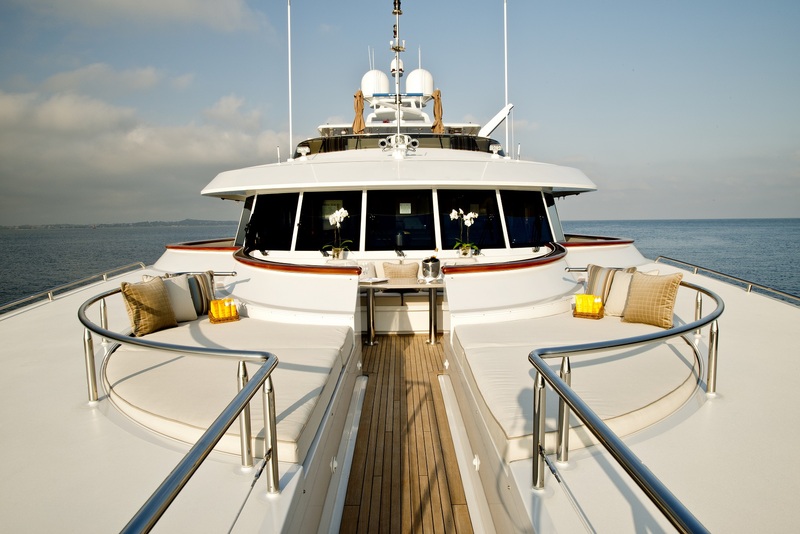 The yacht offers a professional and discreet crew of 9. 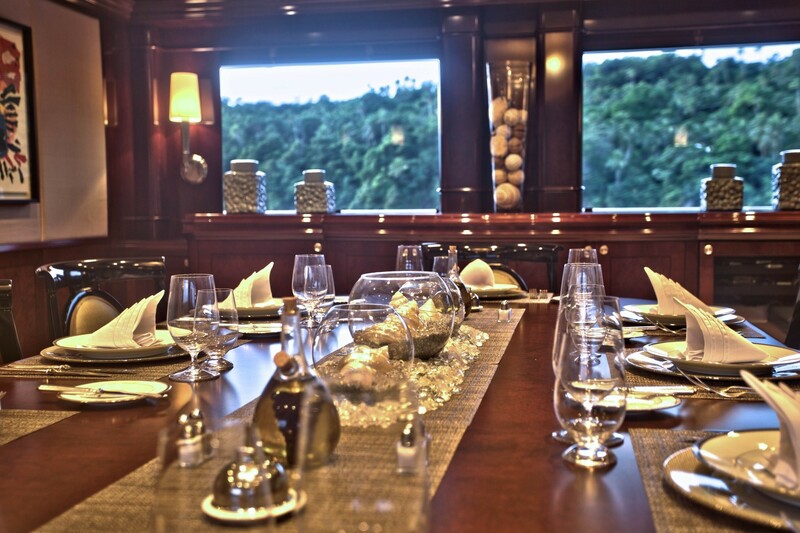 She offers generous and stylish accommodation for up to 12 guests, making her the ideal choice for large groups and families. 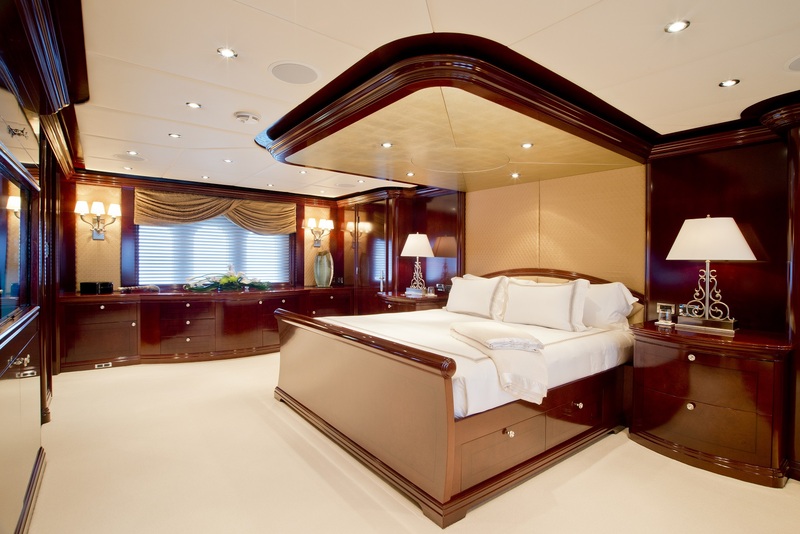 On the main deck forward and full beam of the yacht, is the master stateroom complete with king size bed, private office, separate his and hers walk in wardrobes and massive en-suite with whirlpool tub and marble shower. 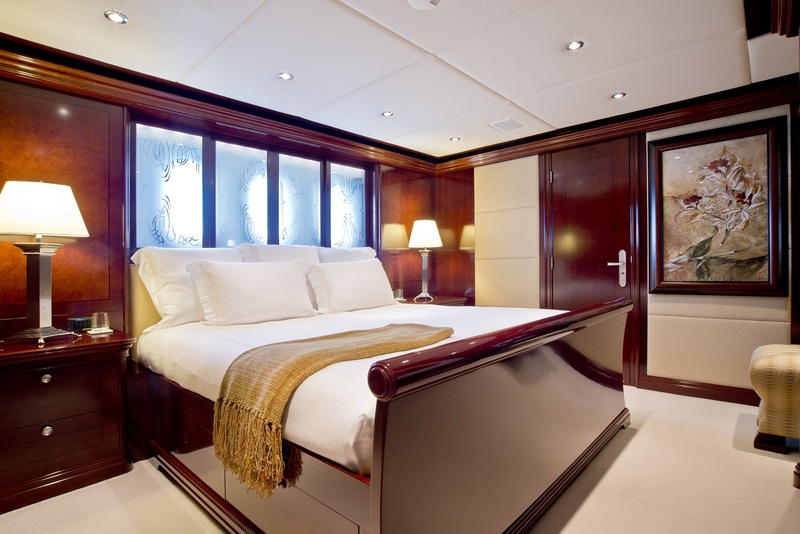 Below decks a further 2 cabins have king size beds, while 2 more guest cabins offer side by side single beds. 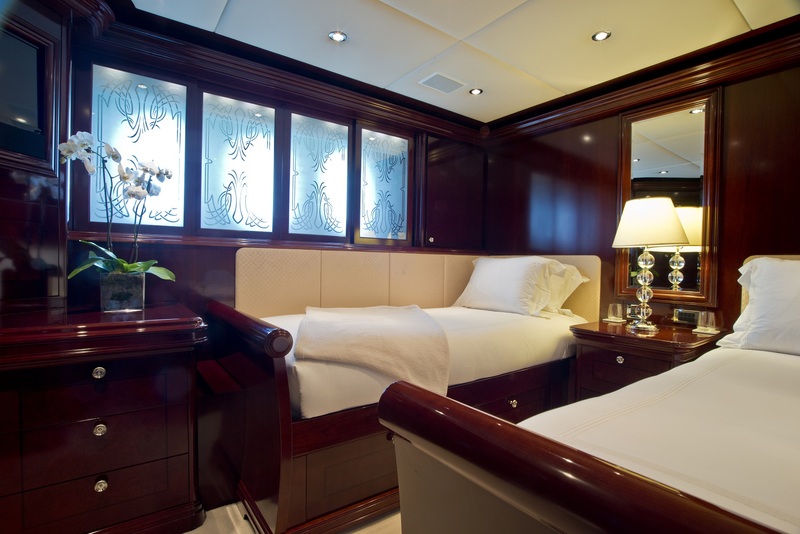 All 4 cabins boast TV entertainment and en-suite facilities, each cabin is light, airy and spacious. 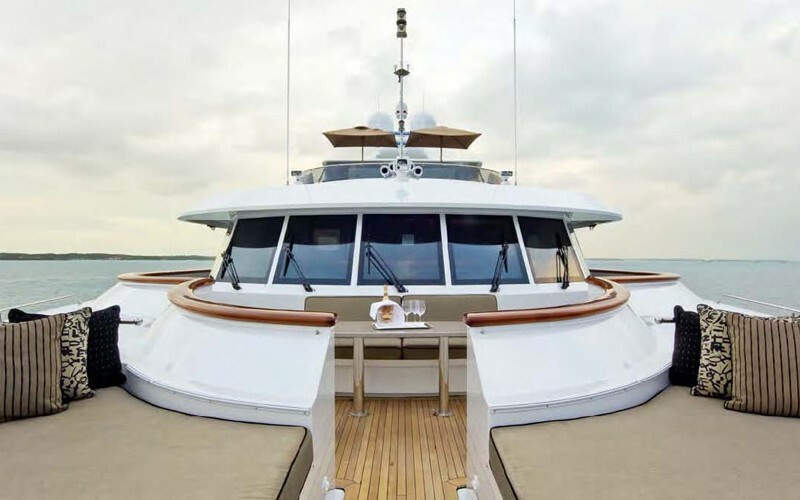 Tenders & Toys onboard the LA DEA II (ex MAIDELLE) yacht includes a Novurania Launch 6.5m tender with 260hp inboard diesel engine and duprop drive. 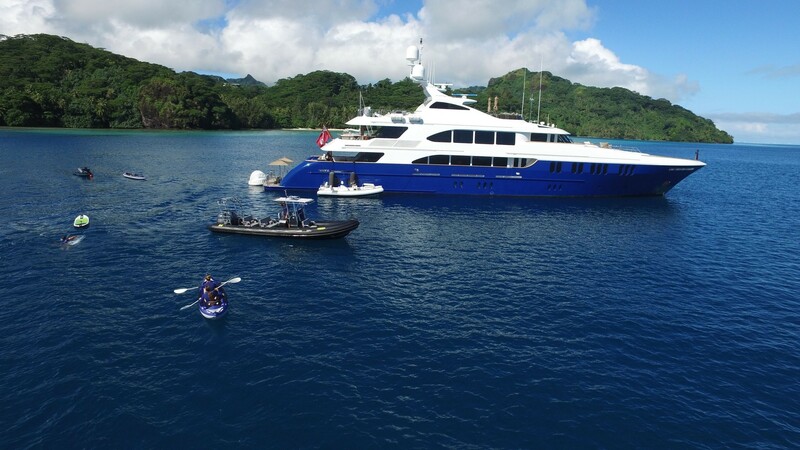 Golden Ship 3.2m tender with 6hp outbosrd engine 2 x Brnad new Yamaha waverunners 2 x Kayaks 1 x adult water skis 1 x child water skis 1 x mono ski 1 x adult wakeboard 1 x child wakeboard 1 x two man doughnut 2 x one man doughnut 1 x Jobe towable couch Assortment of adult and children masks and snorkels Communications SatCon VSAT Fleet 33 Audio Visual Equipment and Deck Facilities Crestron entertainment system. 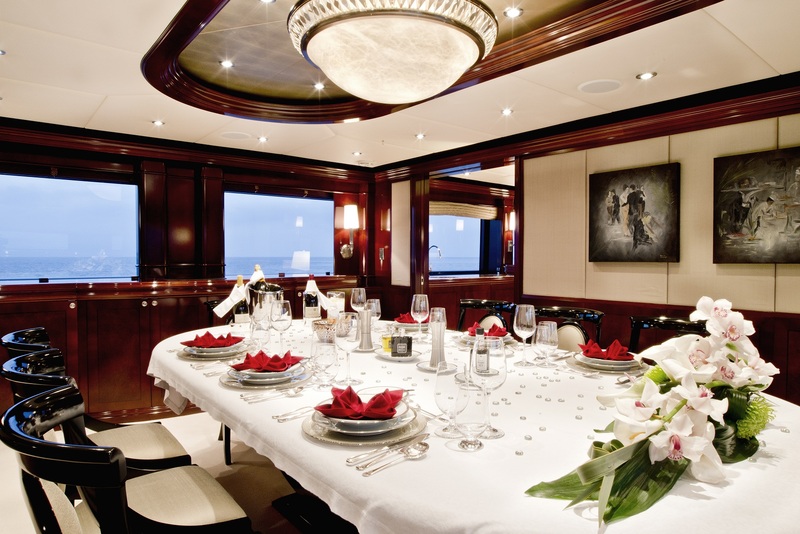 Comprehensive audio-visual system. 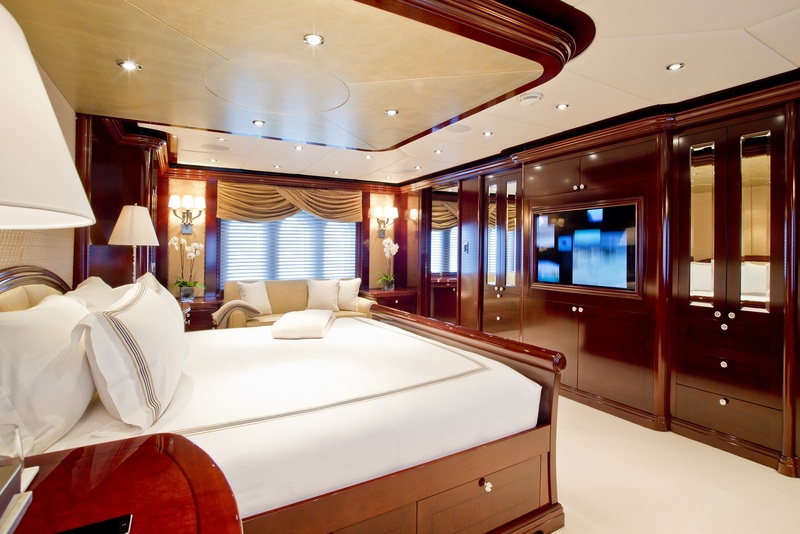 Flat screen televisions through out. 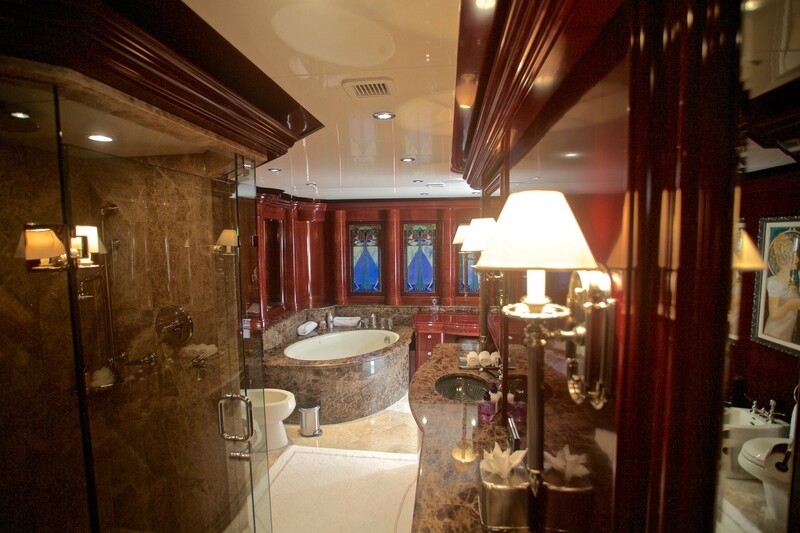 Baby grand piano in the saloon.